Exterior doors are designed to allow you and your guests access to a building and make it possible to enter and exit said building. And since every building obviously has a door, if not several, people do not give them much thought. During the design of the building you make decisions on door and hardware style, location and the finishes such as paint color and whether you want bronze or steel hardware. But it is also necessary to consider security and ease of operation when it comes time to select your door hardware. Door knobs, levers, backplates and locks are all part of a door’s hardware and, like every successful team, they work together. However, some door configurations require additional items. For example, double doors for styles that include french doors, interior cabinet doors and dutch doors will also need a surface or Cremone bolt that is designed to keep one door in place when the adjoining door is open. We have added a cremone bolt to our Willow collection, making it possible for you to fully coordinate the hardware in any space. We recently paired this collection with magnificent Hedgerow Heroic Trees entry door pulls for a spectacular look. Hospitality and residential designers alike know that attention to detail is the key to a well-designed space and the coordinating Willow door bell seen in the center of the photo above will add that all important detail to any project. 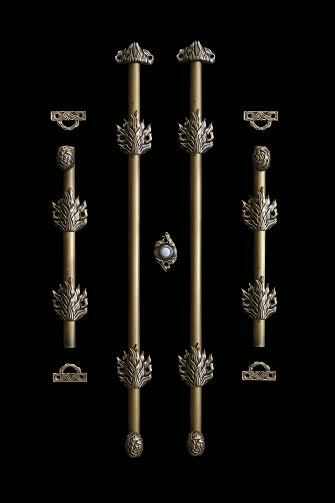 To view each of these collections, along with our entire collection of architectural hardware, please visit our site at http://www.martinpierce.com. This entry was posted in architectural hardware and tagged 2014 hd expo, bespoke cremone bolts, cremone bolt, cremone bolt for doors, cremone bolts, custom cremone bolt, custom surface bolts, surface bolt. Bookmark the permalink.